This super sweet dogs name is Kieko. Every morning and evening my family drives around San Antonio with dry dog food and water and do "rounds" feeding the homeless, starving dogs we see, and around Thanksgiving we came across a sweet, gentle, forgiving Golden Retriever/Chow Chow scavenging for food near a cemetery.We come across many many dogs everyday but something about this poor baby stood out to us and we just knew we had to do something to save him. Keiko as well as all of Gods creatures do not deserve a life filled with cruelty, abuse, starvation, and neglect. In five days, he had became so trusting of me. When he see me round the corner he darts down the street and chases my van until I come to a full stop at the park, where he loyally greets me and sweetly awaits to gobble up what food I have brought . As you can tell from his photos he had sever skin infections, was missing the hair down his legs, around his eyes and back side and stomach and was bleeding all over! Keiko finished his treatment for sarcoptic mange and all his antibiotics.Keiko is doing really well and he is so extremely friendly. His hair is almost grown all the way back! 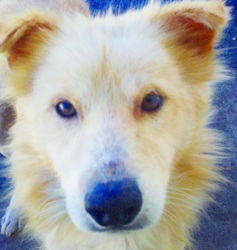 He is in need of a follow up visit, vaccinations, neutering, as well as get state licensed. I believe he should be able to get put on the adoption list as soon as march 1st! Keiko has compleatly finished his treatment and is doing great! He is now current on his vaccinations and will just now need to be fixed. 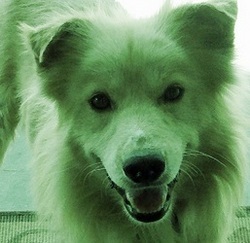 He is an amazing dog with a very sweet teddy bear like personality. After Keiko has regrown all his hair he has become quite the fluffy little pup! Keiko is going to make someone a great pet as he seems is extreamly smart, playful,loyal and just plain cute!